Thirteen-year-old Jamie Francis is facing a lonely summer. She’s just moved with her mother to the rural town of River Bend, Nova Scotia, following her parents’ divorce, and she hasn’t made any friends. But one day, Jamie comes across a neglected horse in a field: a palomino she names Peach. “LOVE. That is all I can say. I’m speechless.” –Anna, age 11, Goodreads. 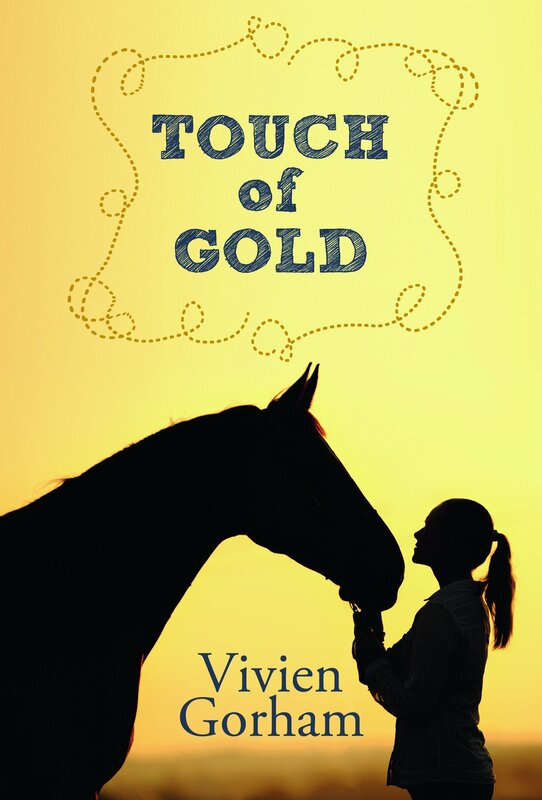 “Touch of Gold will be treasured by horse lovers and young readers everywhere…[The] characters, both human and equine, jump off the page. There’s drama, horsemanship, romance, and more–a real treat to read.” –Shelley Peterson, bestselling author of the Saddle Creek series. “Well-paced and engaging,…Touch of Gold is a tender coming-of-age story, adeptly celebrating the ups and downs of young love, the joy of animals and the life-affirming companionship they give, and the intoxicating power of taking chances and believing in oneself. …[A] thoughtful, moving story of friendship, determination, and courage.” —Jennifer D. Foster, National Reading Campaign. This tender tale of a serendipitous friendship between a lonely girl and an equally lonely palomino will have readers cheering for both Jamie and her training partner, Peach. With plenty of emotional twists and turns, both inside and outside the ring, at its heart, this thoughtfully written story of determination and courage celebrates their powerful bond.” –Jan Coates, author of Governor General’s Literary Award Finalist, A Hare in the Elephant’s Trunk. Available from Nimbus Publishing, Amazon Canada, Amazon US, Amazon UK, Chapters/Indigo, Barnes & Noble, Book Depository, and bookstores everywhere.